George does his bit (and then some) for the cause! 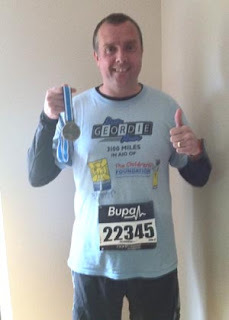 This is the first in a series of articles showcasing those members of TEAM RUN GEORDIE RUN who took part in the 2010 BUPA Great North Run. First up is a guy who knows the North East football scene inside out and is a regular in the stands at both St James Park and The Stadium of Light. Ladies and gents, it gives me great pleasure to introduce the highly respected North East sports writer for The Times; the one and only George Caulkin. 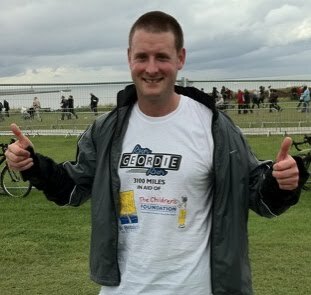 George, not only completed the Great North last Sunday in a time of 02:00:38, but also raised a whopping £1000 to boot for The Children's Foundation and St Benedict's Hospice. Playing a massive part in Team Run Geordie Run's fundraising success last Sunday, George was "Proud and emotional to be a member of the team.". Well I'm sure the two charities are just as proud as you are George of your superb effort. I know that they will be in touch shortly to thank you personally. George, who I've found to be a thoroughly bloody nice bloke actually, can be found on Twitter (@CaulkinTheTimes) and is well worth following. 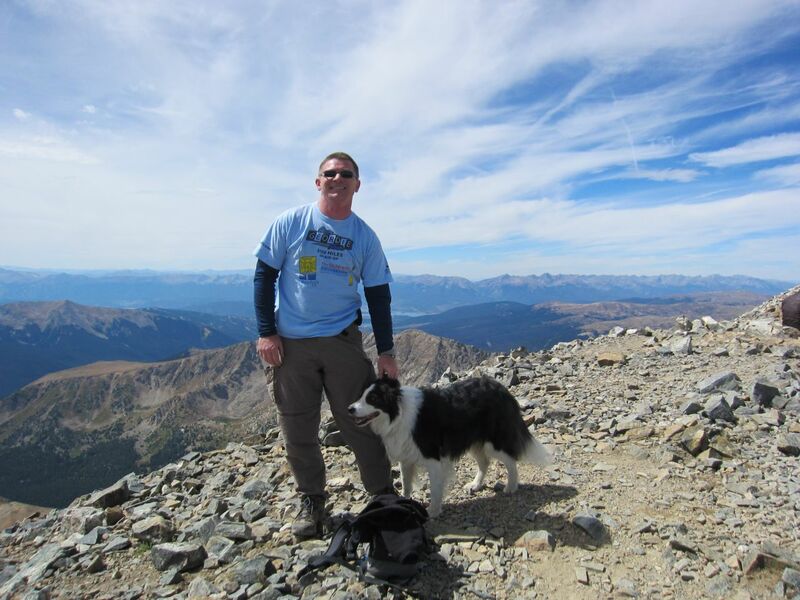 Dear readers of this blog, please do me a favour, next time you see George in a local hostelry, please do buy him a pint, shake his hand and congratulate him on a quite stunning fundraising effort. 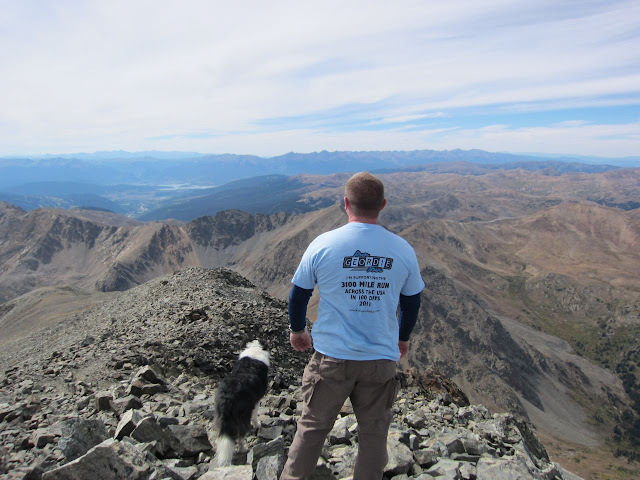 Thanks for your efforts and kind support of the 2 charities George. I'm very proud to have you along as part of TEAM RUN GEORDIE RUN. Run Geordie Run took on a whole new form at the 30th Great North Run last Sunday. For once, it wasn't just me running under the brand. For starters, there were at least 15 folk that I know of wearing Run Geordie Run t-shirts along the route. Hopefully, this has helped to spread the word about the run across the USA even further. 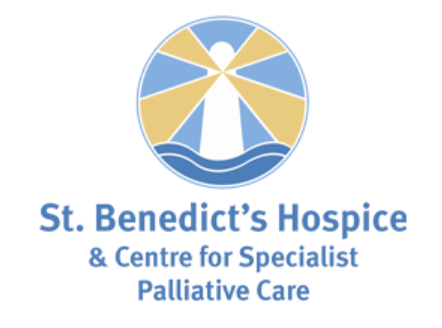 On top of that, there were 4 runners, taking part and raising funds for St Benedict's Hospice and The Children's Foundation. Ladies and Gentlemen, it gives me great pleasure to introduce TEAM RUN GEORDIE RUN. The team comprised George Caulkin (highly respected sports journalist for The Times), John Loughlin (an old university mate of mine), Mick Butler (a fellow attendee of David Fairlamb's Beach Bootcamp) and myself, of course. Although, I didn't expect to be part of the team until I decided to take part in the Great North Run 2 weeks ago. It looks like we have raised around about £1,600 for the 2 charities made up of £1000 from George, £122 from John, £400 from Mick and £80 from me. I've got to take this opportunity to thank George, John and Mick for completing the 30th Bupa Great North Run in aid of the 2 charities. Your support is very much appreciated lads. Not only by the charities, but by me also. The next Team Run Geordie Run event is a self supported 105 mile run in 3 days from Edinburgh Castle to Newcastle Keep. This starts on Friday 19th November with Ian Young, Carlton Fletcher and myself making the long, cold, dark and dangerous journey from Scotland, over the Borders into Northumberland and on to Newcastle. We hope to be joined by Ivan Hollingsworth for the final 2 days. It's going to be a very tough event, but one which I personally need to complete in order to further boost my confidence for USA 2011. 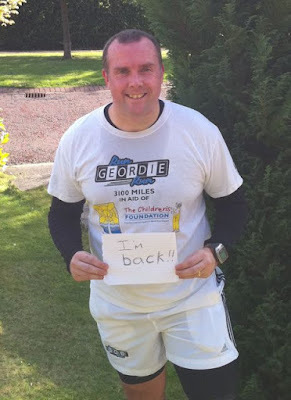 8 weeks to go until TEAM RUN GEORDIE RUN run again! I wouldn't have put money on that, 2 months ago. Who'd have thought that, 4 months after I broke my ankle, I'd complete The Bupa Great North Run. All through the Summer, I anticipated that I'd be able to do light running by the end of October. I had planned to get around the course from Newcastle to South Shields in 02:40:00. In fact, I thought it would be 03:00:00 until I ran the 10.5 mile Peter's Pies 6 Tyne Bridges Challenge in under 2 hours last weekend. Not realising I was running so "fast", I did the first 2 miles in 00:18:38. That pace was no good for me at this stage of my recovery so I took my foot off the gas after that. A slower pace would have happened anyway with only 2 weeks of training under my belt. Slowing down early on made the whole experience, arguably, one of the most enjoyable of them all. By my calculations this was my 9th Great North Run and my first since I ran it with a hangover in 2001! A lot of differences were apparent in that time. Firstly, the start seems a lot more organised and, despite the number of participants, it's not too crowded. Secondly, the support all along the route, appears to have grown. Thanks mainly to the excellent BBC coverage I would imagine. I saw a lot of familiar faces along the course and a few people asked me about next year's run across the USA (having read the details on my t-shirt). Add on top of that the amazing support I received via Twitter and Facebook and it made for a really great day. All in all it was a very enjoyable experience and one which I'm looking forward to repeating next year when I'll be in the shape of my life having just run 3100 miles across the USA. Oh, and the fact that I got round in 02:22:48 got me quietly smiling inside. I've got until Friday, to think about how I break that news to the physio! My Garmin stats for the Bupa Great North Run are here. Wednesday 15th September 2010 - Personal Training Session. (01:00:00). Saturday 18th September 2010 - 2.1 mile run, Tynemouth. (00:22:34). Saturday 18th September - David Fairlamb's Beach Bootcamp. (00:45:00). Sunday 19th September - 13.3 mile run, The Great North Run. (02:22:48). Right! Where was I before I was rudely interrupted? I made my long awaited return to running outdoors last week. I'd had a few sessions on the treadmill during the week and I decided the time was right to take things outside. The first run I did was a 4 mile effort in Tynemouth. I did David Fairlamb's Beach Bootcamp straight after that. I found the bootcamp very difficult indeed with limited flexibility in my right ankle making for awkward movement on the uneven sand. Fast forward 7 days to last Saturday and with more flexibility, Beach Bootcamp was much easier. What a difference a week makes! In between those 2 Beach Bootcamps were a number of 4 and 5 mile runs. An easy steady pace was the order of the day and I'm glad to report that all runs passed by incident free. The crowning glory of the week, however, was the 10.5 mile Peter's Pies 6 Tyne Bridges Challenge on Sunday. I had originally planned to walk some of this route but in the end I didn't need to. I reached the finish line at the Millennium Bridge in very fine shape indeed. I wrote the following on Twitter at the time: "Less than 4 months since I broke my ankle and I found that 10.5 miles in 01:59:36 very easy indeed. This comeback is gathering pace.". That just about sums it up and had somebody told me back in May, when I broke my ankle, that I would run 29.6 miles in the 2nd week of September I would have laughed at them. I'm really surprised that my running fitness seems to be coming back very quickly. It had taken 70 weeks of training to be able to comfortably run 19 miles per day for 7 consecutive days, before I broke my ankle. I think I'll be back to doing that in another 8 weeks. I'm still remaining cautious though and I'm prepared to reign things in at the slightest sign of pain in the Paddy Power Bionic Ankle. If the physio reads any of this, he'll go mental! Especially the bit where I tell you that I'm doing the Great North Run this weekend. I was offered a place 2 weeks ago and simply couldn't turn it down. I thought at the time, that I'd try to get round in 3 hours. I think a more sensible estimate is probably 2 hours 40 minutes. Any quicker than that would be foolish at this stage of my recovery. So it looks like I'll be on for The Great North Run, a personal training session and Beach Bootcamp this week. I'll say it again; "This comeback is gathering pace!". I was recently interviewed on BBC Newcastle's Total Sport programme by Simon Pryde, John Anderson and Marco Gabbiadini. You can here the full audio here. Monday 6th September 2010 - 5 mile run, Race Course. (00:52:42). Tuesday 7th September 2010 - Personal Training Session. (01:00:00). Wednesday 8th September 2010 - 5 mile run, Race Course. (00:53:20). Thursday 9th September 2010 - 5 mile run, Race Course. (00:54:06). Saturday 11th September 2010 - 4.1 mile run, Tynemouth. (00:41:58). Saturday 11th September - David Fairlamb's Beach Bootcamp. (00:45:00). Sunday 12th September - 10.5 mile run, Peter's Pies 6 Tyne Bridges Challenge. (01:59:36). "Another milestone" is getting to be an oh so familiar headline these days and a one that I take great pleasure in writing. Once again, another £1000 milestone has been passed. 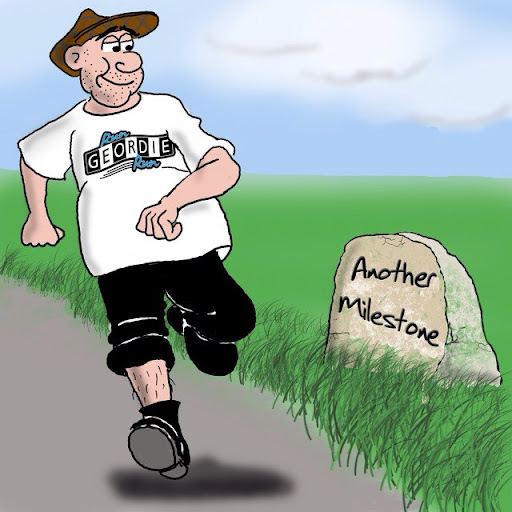 This time it is the £16,000 milestone. Along with some Run Geordie Run t-shirt sales, it was a very generous £1000 donation (£500 to each charity) from The Northern Rock Foundation that got the charity fund up to an amazing £16,309. I update the 2 charities every week with all donations made and every time a £1000 milestone is passed I entitle the email "Special Update". There have been 3 such emails in the last 3 weeks! The amount of money pledged to the 2 charities, together with my return to running, has seen my confidence and morale soar massively. Long may that continue! Thanks to everyone who has sponsored me, bought a t-shirt or CD and also to The Northern Rock Foundation for their very generous donation.